Tokyo University and a consortium of 7 companies have launched a long-term joint research project to develop next-generation robot and information technology aimed at supporting Japan's aging population. Over the next 10 to 15 years, the group (known as CIRT) aims to help develop robots that will, among other things, assist the elderly with housework and serve as personal transportation capable of replacing the automobile. According to an announcement made by CIRT on August 4, group participants include Toyota, Olympus, Sega, Toppan Printing, Fujitsu, Matsushita (Panasonic), and Mitsubishi. The Ministry of Education, Culture, Sports, Science and Technology (MEXT) will play a supportive role and bear half the cost of the research, which is expected to be as high as 1 billion yen (US$9 million) per year. Around 100 researchers from academia and the private sector are expected to participate in the project. The participating companies will work together to combine information technology (IT) and robot technology (RT) to form a new type of technology called information/robot technology (IRT), which organizers claim will spawn new industries that will succeed the automotive and computer industries. In addition to simply developing new robots, the project is designed to spur innovation in software and other technology for automotive, home appliance and medical applications. The project timeline includes developing robots capable of straightening up rooms by 2008, robots capable of making beds by 2013, and robots capable of lifting/carrying the elderly by 2016. Other goals include developing robots that can arrange products on supermarket shelves, fold laundry and perform heavy-duty cleaning. Enhancing robot autonomy appears to factor highly into the goals of the project, which hopes to see the development of autonomous robots able to perform product assembly work with little supervision. Another project objective is to contribute to the development of autonomous personal transporation robots capable of moving safely through busy intersections by 2016. The development of this technology, for example, would rely on Toyota's expertise in robot development combined with Tokyo University's research on human intention recognition technology. Japan's declining birth rate means the work force is shrinking and the population is aging. CIRT believes the next generation of robots can help bring about a more productive and comfortable society by boosting the efficiency of the work force and taking on the unwanted tasks of a graying society. However, developing robots, no matter how advanced, does not address another major problem foreseen by the Japanese government: how does a shrinking tax base pay for ballooning social security costs? Will this new breed of robot also be called upon to pay its fair share of taxes? Awesome website, the colors work really well. 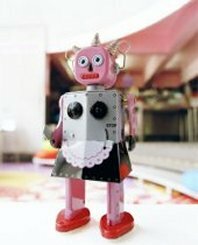 I dig the robot in the picture, i wonder when we really will have robot maids, that would be awesome.